Correct cleaning of processing plants is a basic requirement in food production. The entire cleaning operation is called sanitization, and is composed of 2 main phases: cleaning and disinfection. The cleaning, recommended after every processing cycle (6-8 hours approx. ), can be either chemical, based on the type and concentration of chemical solutions used for cleaning (detergents); kinetic, with the use of mechanical powers such as turbulence (ideal speed 1.5/2 m/sec); thermal, through recycling of hot water, based on the pasteurisation principle. For closed circuits, the suggested temperature is of 85-90°C for at least 15 minutes. 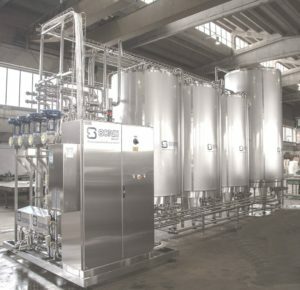 Automatic CIP cleaning units from Sordi are composed of 3 or more tanks with variable capacity based on the idle volume of the plant to be cleaned; one or more feed pumps; one or more dosing pumps for detergent; pneumatic connection valves; indirect heater/heaters of detergents and water with temperature control; control instruments with conductivity control and, on demand, with output control; control panel for the control of the cleaning phases programmed by PLC. Manual pre-assembled CIP units with temperature control and timing of cleaning phases are composed of: 1, 2 or 3 tanks for detergents; centrifugal pump for delivery of cleaning solutions; cleaning solutions return pump; thermometer; electric or steam heater; control panel, fittings.